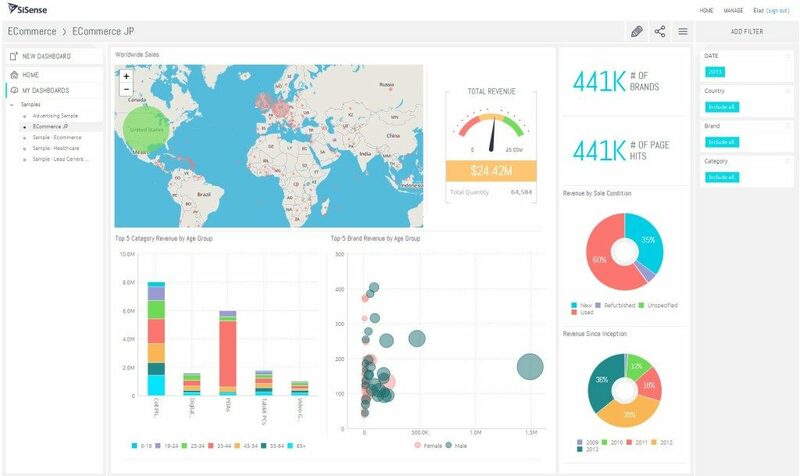 A good business intelligence (BI) software allows you to convert raw business data into useful information for the purpose of business analysis. Companies can use this insightful information to create new business opportunities as well as identify potential challenges. If you are looking to invest in a good quality BI program, you’ve probably heard about Sisense. How much does Sisense cost? In this article we’ll take a look at Sisense pricing, features and other important elements of this service to give you a solid overview of what you can expect from it. Hopefully, after your read our analysis you’ll be able to decide if Sisense is a software that can actually improve your business. Our SaaS experts hold Sisense in high regard as it offers excellent features and reliable customer support. In fact, Sisense has come out on top in our test of leading BI services. It offers flexible pricing plans to suit the varying needs and budgets of large and small organizations. The vendor also offers an excellent free trial plan which allows you to check for yourself why this app is appreciated by users and reviewers alike. The free demo will allow you to test how the app’s features can boost your own business. 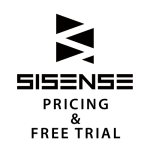 You can easily sign up for Sisense free demo here. What makes Sisense stand head and shoulders above the competition? To start, the software enables you to easily analyze and visualize both big and different datasets. The app’s In-Chip technology allows it to effectively use CPU cache memory to process data only when a new query is made. This allows Sisense to scale to terabytes of data by thousands of users. Simultaneous queries return results in seconds, even when users work with billions of rows of quickly changing data. Second, the software eliminates the restrictions of conventional BI. Traditionally, analyzing complex data needed multiple tools and a department of experts who worked to get meaningful insight from the data and create reports. However, Sisense is an all-in-one BI program that eliminates the need to use a variety of tools. It allows users to build complex data models in a visual environment. Users can explore and drill down into this data and get instant answers to their queries. Third, Sisense takes the burden off your IT unit. This app shows that you don’t need extensive IT investments to tackle big data. The software’s In-Chip engine uses computational resources optimally and eliminates the need to buy and maintain huge hardware and software stacks. The app makes data and insights easily available to administrators and analysts, allowing IT staff to concentrate on their main tasks. You can find more information about Sisense pros and cons in our detailed review. Filters data by dropping fields on the canvas. If you wish to learn more about the software and its features you can find more information in our review of Sisense. How much does Sisense cost? The vendor offers a flexible and scalable annual pricing plan that is suitable for the needs and budgets of both small companies and large organizations. Simply visit the product website and provide basic information about your business needs and the vendor will give you a quote depending on the scale of your operations and the size of your company. If you want more details about Sisense pricing, you can request a quote here. Sisense also offers a fully functional free trial that takes you from data preparation and analysis to visualization – in just minutes. You can easily check out if Sisense suits your business needs by signing up for the free demo here. Sisense is undeniably the leading BI system because of its top rate features and excellent customer support. However, if you are looking for a wider choice, you should check out the following five applications that offer similar features and services. You can get two months free by opting for annual billing. There is no doubt that Sisense is the best pick among the apps reviewed in this article as it offers high value and excellent tools. The vendor offers flexible pricing quotes that can suit the needs of both small and large organizations. You are sure to get full value for your money by subscribing to any of the pricing packages. You can easily check out if Sisense fits your business requirements by signing up for a free trial here.